The US broadcasting network MSNBC has suspended prime-time host Keith Olbermann for making political contributions. The Politico news website said he had contributed to the campaigns of three Democratic candidates. MSNBC President Phil Griffin said Olbermann had been suspended without pay. 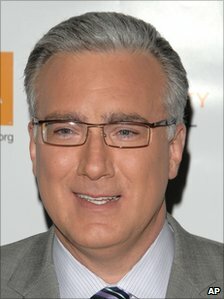 During coverage of the US mid-term elections, Olbermann was one of the network's key presenters. "Mindful of NBC News policy and standards, I have suspended him indefinitely without pay," Mr Griffin said, according to a statement quoted by the Huffington Post. With Rachel Maddow, Olbermann has been one of the most prominent hosts on the network, which analysts say has come to be seen as liberal-aligned.